I can tell u spend time to make it. very good and go for it, look forward for ur new work. Hi Jeannie - 'Welcome on blog!' Have a great blogospheric day. Hi Jeannie ~ AHA just the blog I am looking forward to, making my wishes come true. Very handy for 'banana people'. 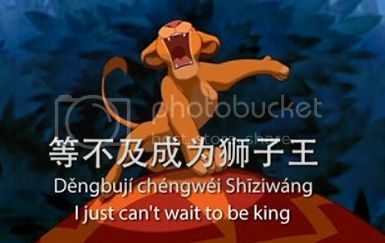 Can now lean more pinyin and Chinese. Xie xie ning! I appreciate all your support, Sandra and BlogDirectionary. CheaHS@n: I'm glad that you found my blog helpful. What's "banana people"? By the way, you can become my free member for extra learning materials and requests. Just click the yellow button on the top right where it says "*CLICK HERE* Become My Free Member..."
Hi Jeannie ~ Skin color of banana is yellow (represent Chinese) and the inside is white (represent AngMoh/Caucasian). So 'Banana people' are those Chinese who are English educated and dont know Chinese/Mandarin. You may come across plenty of them in USA especially those new generation of ABCs (American Born Chinese). LOL...I see. That is interesting. Thanks for your explanation, BlogDirectionary. Xiexie ni chengwei wode huiyuan, CheaHS@n.
i m sure not kids but also other age people will enjoy ur sites. Mandip, Thanks for your nice comment and I hope you enjoy too. Learn songs for children in any language is very useful to know how people from different countries learn their native languages. All language students should begin learning like that.